Another free movie screening in the Capital Region is coming! 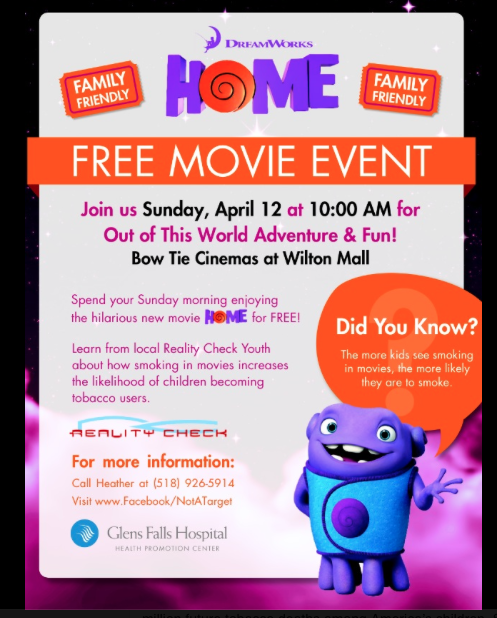 See the new movie “Home” for free on April 12th at 10 AM at Bow Tie Cinemas in Wilton Mall. Sponsored by Reality Check of the Living Tobacco-Free initiative of Glens Falls Hospital. Call (518) 926-5914 or visit Facebook/NotATarget for more information. No ticket necessary- just arrive for the event and you will get in for free!